It may not look like much but few foods are more comforting to me than this one. 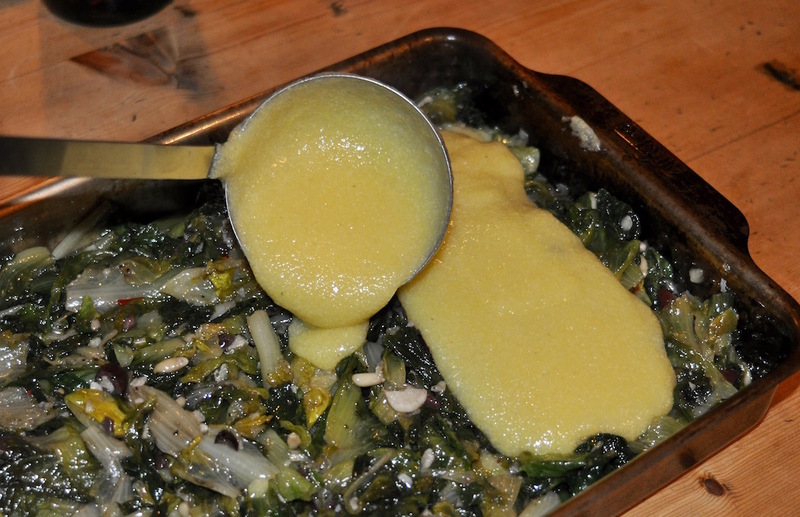 I've been eating polenta with escarole since I was a boy and no matter how many times I make it, it always tastes the same. Even when it isn't. Anyway, it's New Year's Eve and we've all got lots to do. I'll get right to it then. 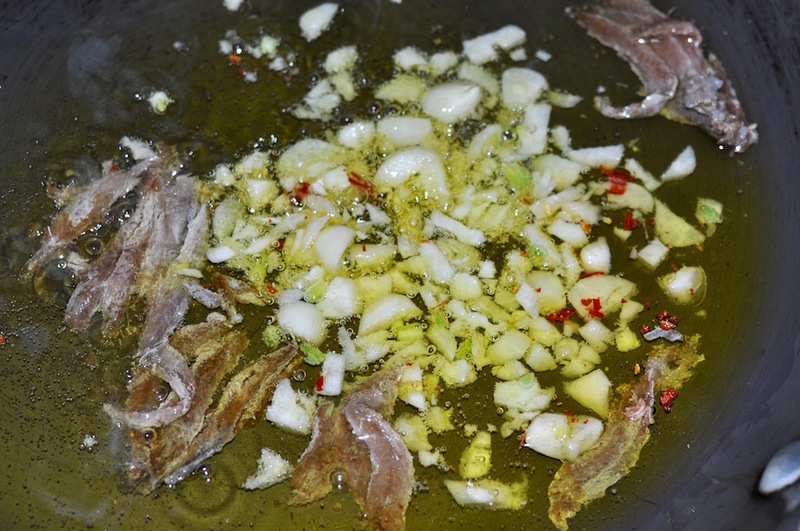 As with so many good things, start out by sauteing lots of garlic, anchovy and a little hot pepper in plenty of good olive oil. After a couple minutes toss in your escarole and cover so that it steams a bit. 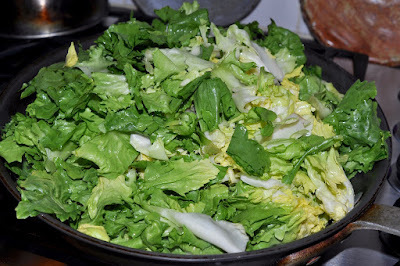 This is 3 bunches of escarole here, which have been cleaned and chopped. 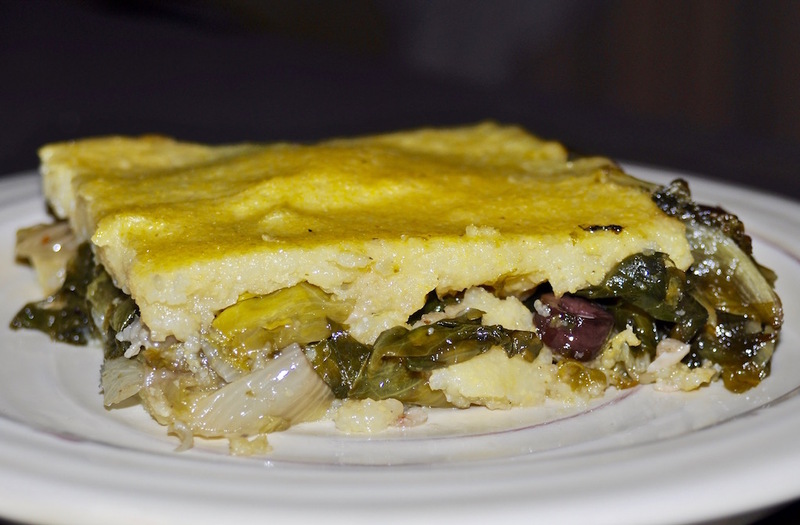 Making polenta is an inexact science and so go with the way you're most comfortable. In terms of quantities for this dish, I used 1 1/3 cups of polenta and cooked it in around 7 cups of water. Assembling is a piece of cake. Just put down a layer of the polenta in a baking dish that's been lightly coated with olive oil, so that the bottom of the pan is completely covered. 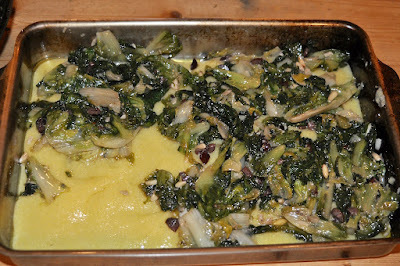 Then add the escarole, but make sure not to use very much of the liquid that's left in the pan it sauteed in. I just scoop out the escarole with a slotted spoon. 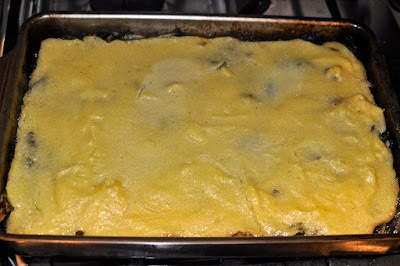 All that's left to do now is put down another layer of polenta, at which point cover the pan with aluminum foil and place in an oven preheated to 375 degrees F. After 30 minutes remove the foil and bake for another 15 minutes or so. 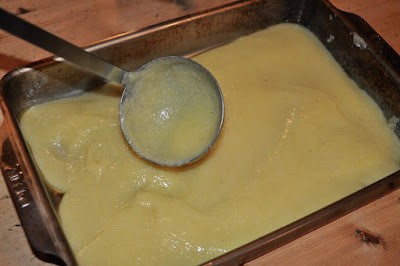 The edges of the polenta should start to brown slightly. Think of it as if it's lasagne; that'll help figure out when it's done. This was in the oven close to an hour. It's best not to cut into it immediately; let it rest at least a few minutes or more and then have at it. 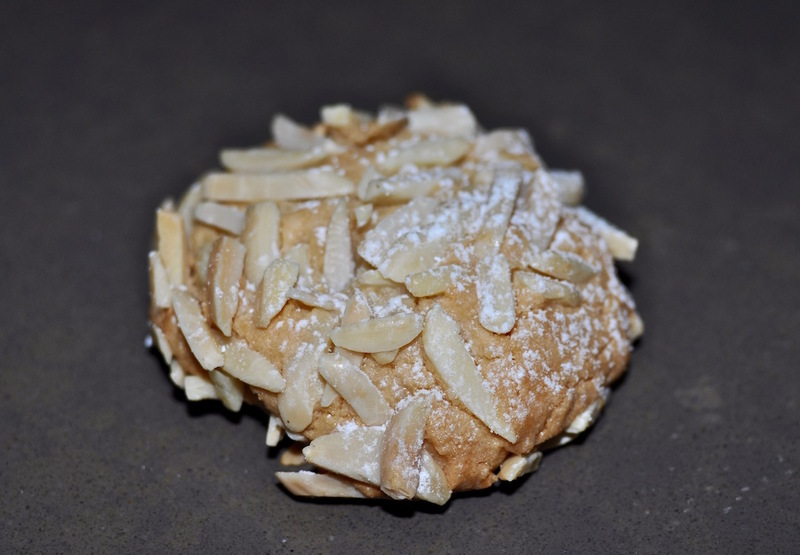 If these specimens remind you of traditional pignoli (pine nut) cookies, there's a good reason: They are exactly the same cookies, just with almond slices outside instead of pine nuts. There's also a reason that I bothered to do this, though how good a reason I'm not entirely certain. 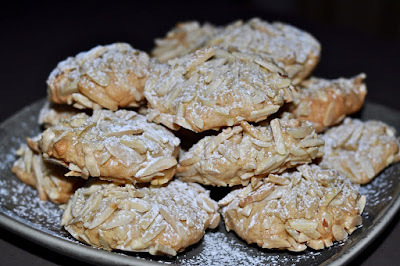 See, I get a lot of emails around the holidays asking about my pignoli cookie recipe. 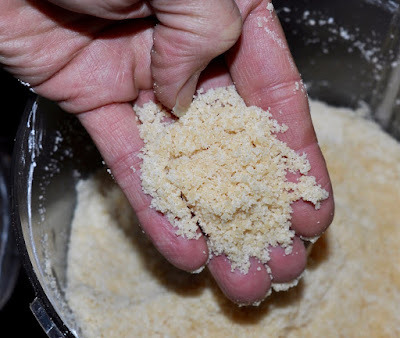 Some ask why I use a little flour (I think it improves the texture and makes the cookies easier to make); others bemoan the fact that they can't find almond paste in their part of the world. This year I've been approached by several people who've complained that pine nuts mess with their taste buds. The specific charge is that some pignolis leave a bitter or even metallic taste in their mouths. And not just for a few moments, but possibly as long as days. I poked around some and, sure enough, found that there is something called "pine nut syndrome." 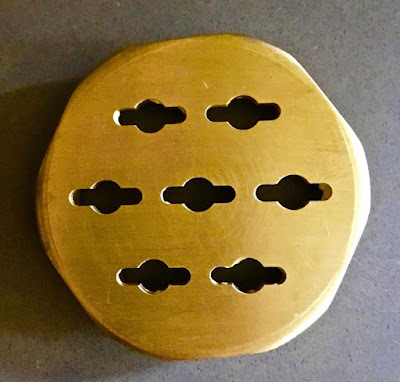 It's a mystery what this is exactly. But it's a real thing. Even the Food and Drug Administration is onto it, noting that for certain people eating pine nuts "decreases appetite and enjoyment of food." We cannot have any of that around here, of course. Certainly not around the holidays. 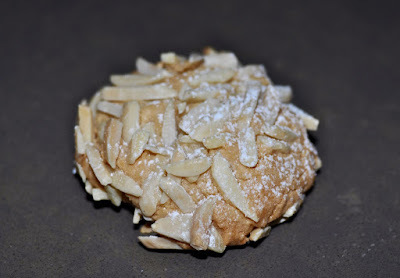 And so allow me to present a new holiday tradtion to the pine nut-afflicted among us: The pignoli-less pignoli cookies, made not with pine nuts but with almonds instead. Hey, we're all about inclusion here. 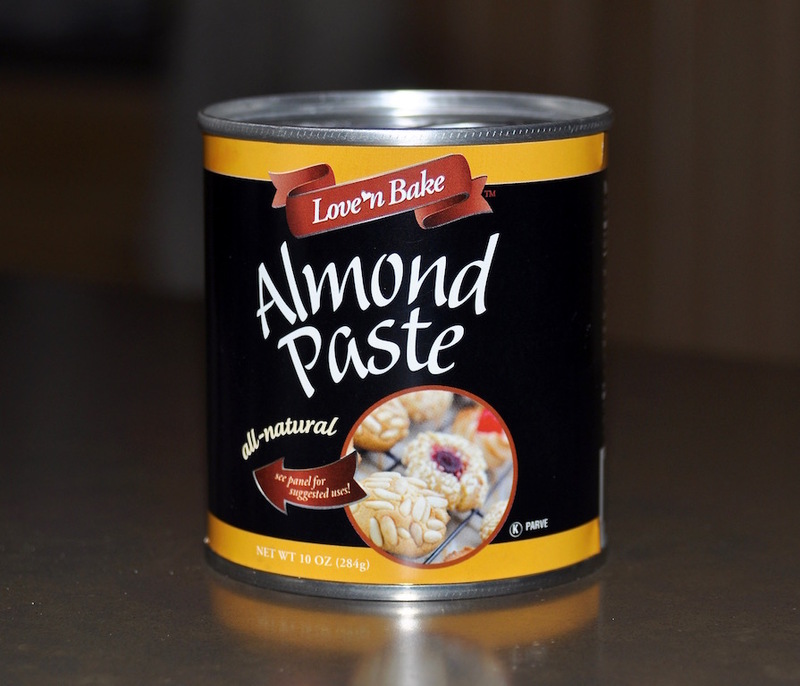 First of all, the only kind of almond paste you can use is the kind that comes out of a can like this. I get a lot of emails asking if it's okay to use the paste that comes out of a tube or a box. It isn't okay. I realize that some people have trouble finding canned paste where they live, but it's what you need if you want to make these cookies. Break up the paste and put it in a food processor with 1/4 cup sugar, 1/2 cup confectioners sugar, and 3 tablespoons of all-purpose flour (the complete ingredient list is below). Process until fine. Again, this won't take long at all. Here's the completed dough. It's not a lot, fits in the plam of my hand. 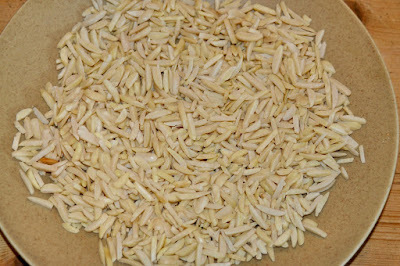 Empty 6 to 8 ounces of sliced raw almonds into a plate or bowl (or any work surface you prefer). 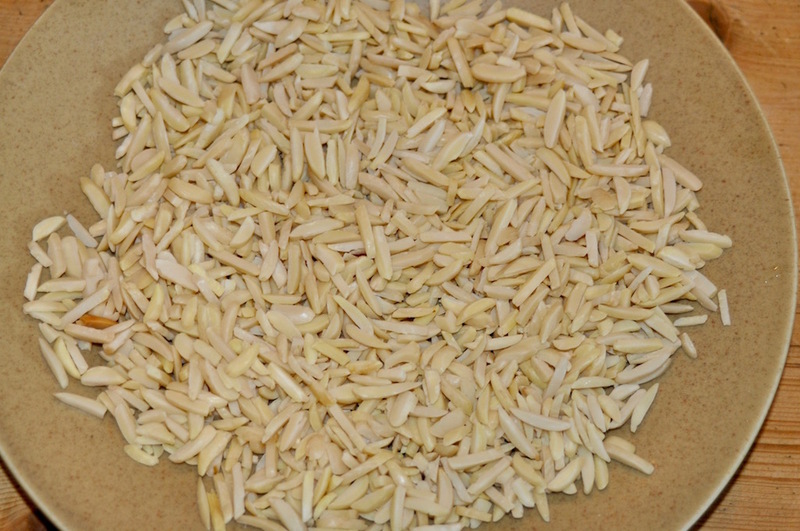 Sliced almonds come in different forms; use whatever type you like. Have a bowl of water on hand. 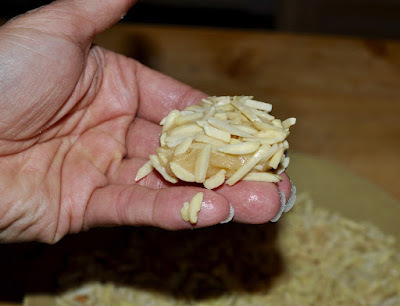 Dip your fingers in the water, take a small piece of dough, then roll it in the almonds until completely covered. Don't bother being delicate with the dough, just work things until the almonds adhere. Line the cookies on a parchment-lined baking sheet and place in the oven preheated to 300 degrees F. After 10 minutes rotate the sheet. After another 10 minutes check to see if the cookies have gotten golden brown. 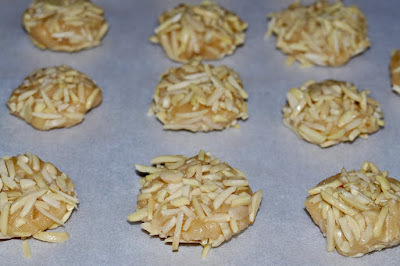 If they haven't rotate the tray again in 5-minute intervals until the cookies are done, at which point place them on a rack to cool. 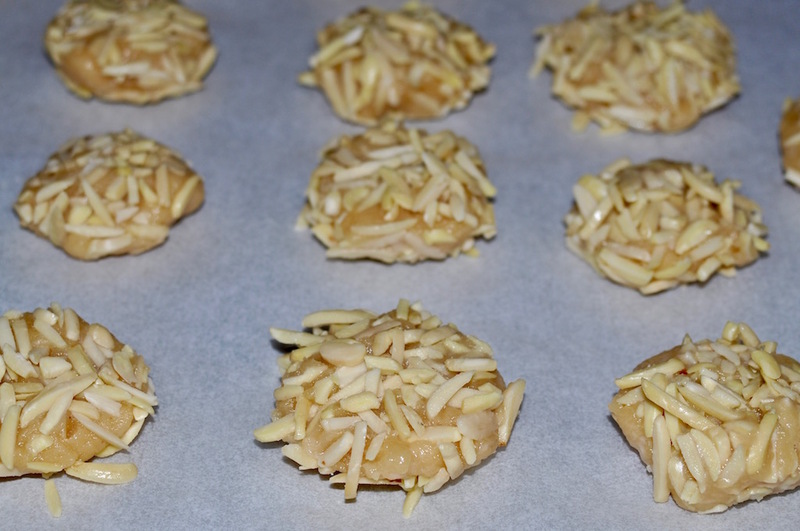 This batch wound up taking just under 30 minutes, and they tasted totally swell. The pignoli-less pignoli cookie tradition might actually have some legs. Pay attention because this is important: It only looks like a pasta course you have seen me prepare here a couple hundred times before. But it isn't. Until a few weeks ago I didn't even know such a thing as this existed. I swear. 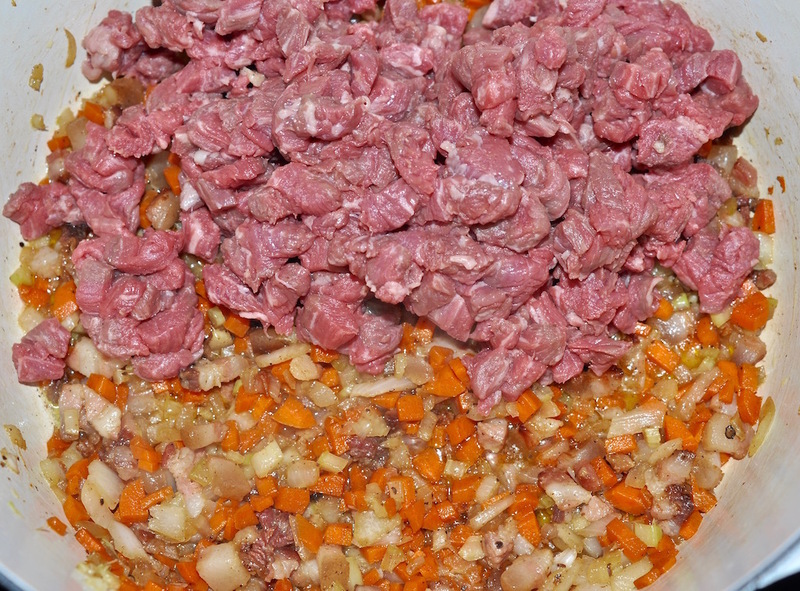 What you have here is the official, government-sanctioned recipe for Ragu alla Bolognese, commonly referred to as Bolognese Sauce. 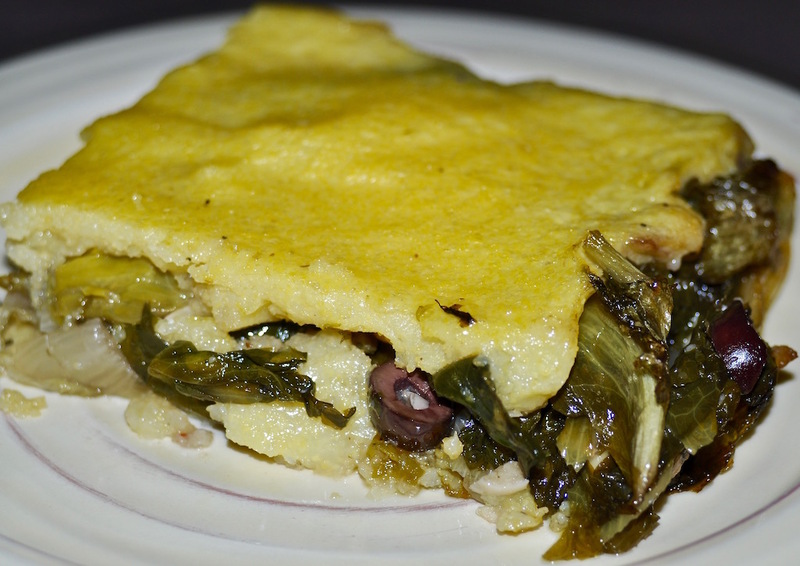 The recipe was "notarized and deposited" in the Chamber of Commerce of the City of Bologna on October 17th, 1982, by "solemn decree" of the Accademia Italiana della Cucina (the Italian Academy of Cuisine). Turns out, not many. 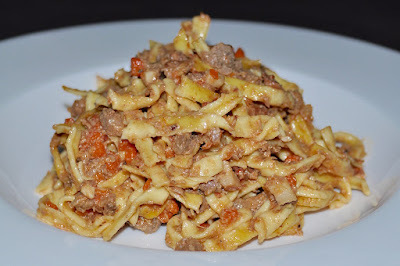 My friend Biancamaria is from Bologna and she never heard of any "official" Ragu alla Bolognese recipe. Which is saying something because, as she tells me, "when I was a child every Sunday we had ragu." 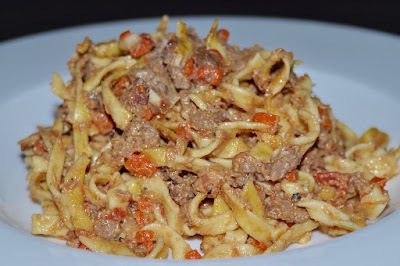 I didn't catch up with Bianca on a recent visit to Bologna (she's living in the English countryside now with Massimo and their daughter Delfina) but on at least four occasions I got to sample authentic Ragu alla Bolognese. 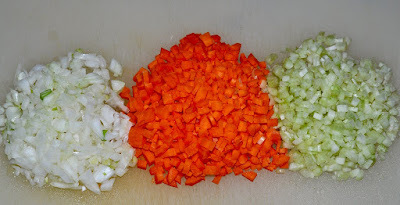 And it's nothing like many of the so-called Bolognese sauces you'll come across elsewhere. For starters, a lot of "Bolognese" sauces are basically tomato sauces that have meat in them. 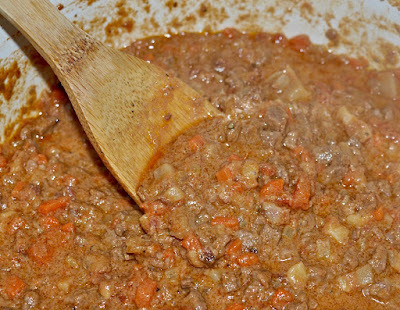 A real Bolognese is a meat sauce that has only a touch of tomato. The earliest examples of Ragu alla Bolognese didn't include any tomato at all. And forget about using pasta shapes like spaghetti; nobody in Bologna would even think of pairing their ancient ragu with anything but a flat, fresh pasta such as tagliatelle. Just ask for tagliatelle at a restaurant in Bologna and watch what you get. Same thing if you ask only for ragu. Anyway, and as you no doubt have surmised, I just had to give the "notorized" recipe a shot. I've reprinted it in its entirety below, but here is the link as well. 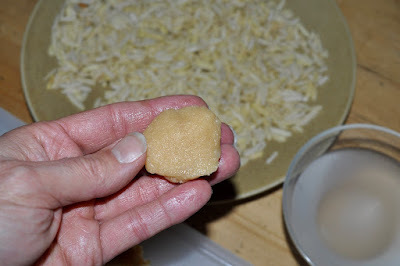 Just a note about the ingredients: My quantities are not exactly those shown in the recipe. I have, however, made the necessary adjustments to follow the recipe as closely as possible. Start out by finely chopping equal amounts of onion, carrot and celery. Here we've got just under 3 ounces of each. Finely dice around 1/2 lb. 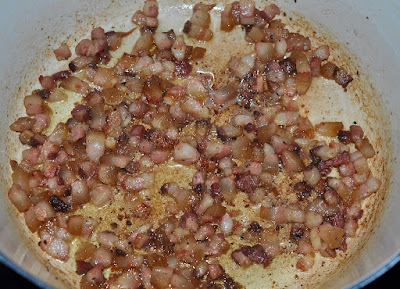 of pancetta and then brown in a Dutch oven that's large enough to accommodate all the recipe's ingredients. 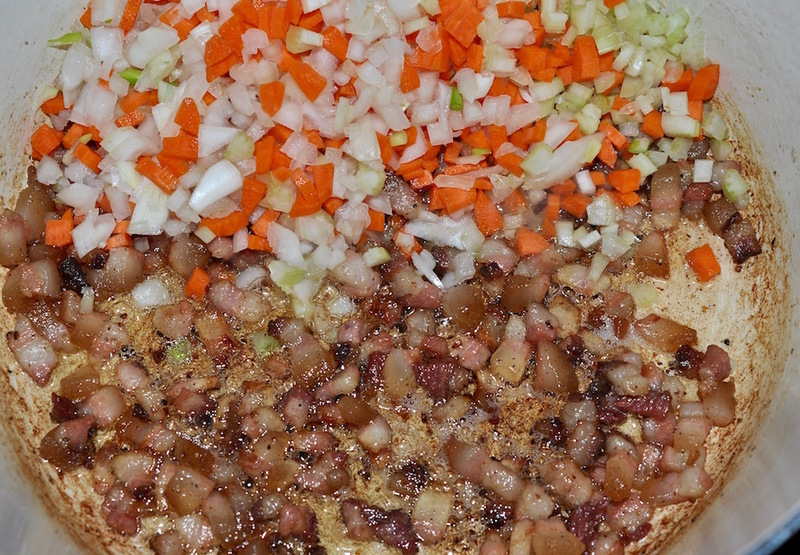 Add the onion, carrot and celery to the browned pancetta and saute until the vegetables are nicely softened. Okay, about the meat. The recipe calls for ground skirt steak, but skirt wasn't available and so I went with tender hanger steak instead. 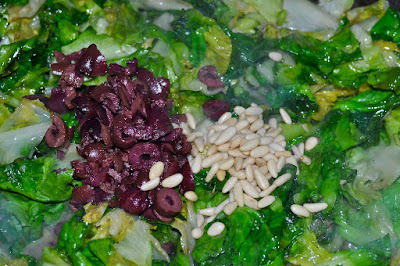 Rather than grind the meat I decided to very finely dice it, as I have seen both approaches taken. 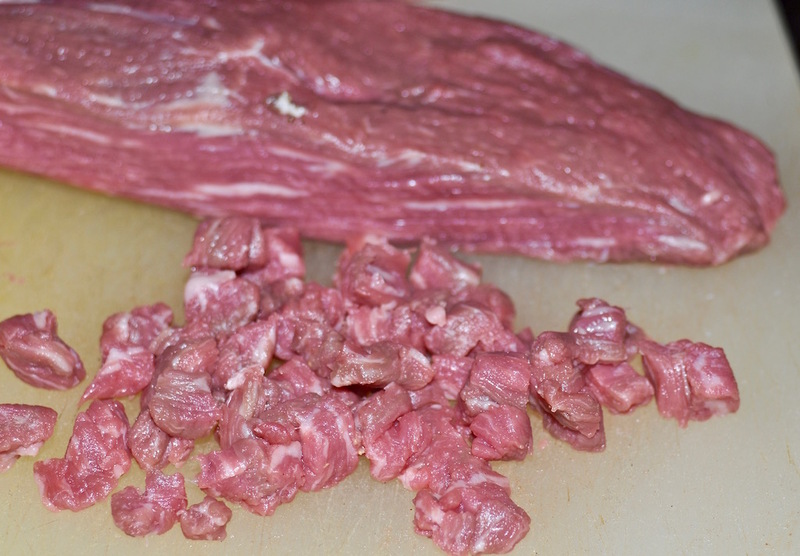 This is one pound of beef. Once the vegetables have softened add the beef and allow it to brown. Then add 1/2 cup of wine (I went with white but red is also approved) and, here's the tricky part, a small amount of tomato. 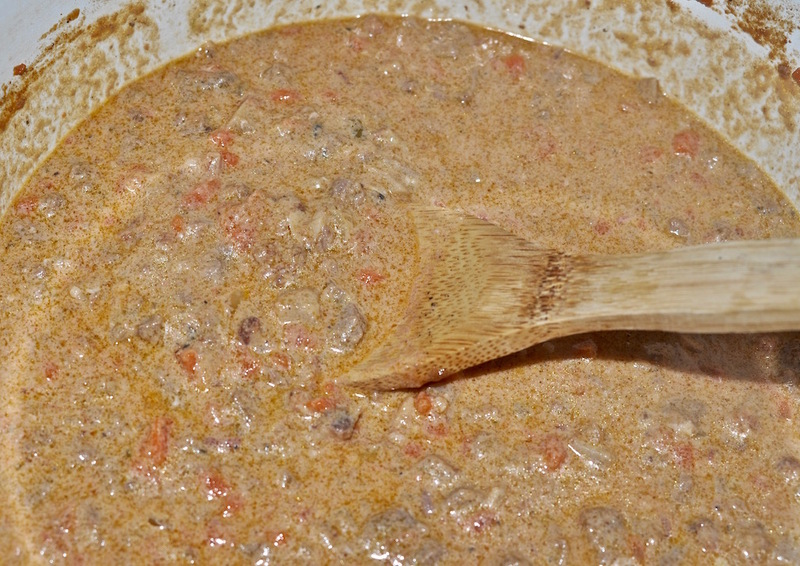 The recipe calls for either tomato sauce or highly concentrated tomato paste. I made a small quantity of very simple tomato sauce and added around a cup here. I also added a little homemade beef stock, as this is also mentioned in the recipe. At this point things are supposed to simmer for two hours, at a low flame. But don't expect to make yourself scarce for these couple hours. Because little by little you'll need to stir in very small amounts of whole milk, at fairly regular intervals, until you've gone through one full cup. Speaking of milk, an "optional but advisable" addition to the sanctioned recipe is panna di cottura. Basically that means whole milk that has been slowly simmered to half its original volume. That's around 1 1/3 quarts of milk you see in the pot there. 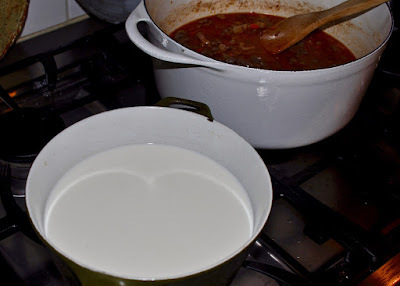 While the sauce was slowly simmering so was the milk, until it was halved. After two hours of simmering (and only a slight addition of salt and pepper to taste) this is what the ragu looked like. But we aren't finished yet. The next step is to slowly stir in the panna di cottura (the reduced whole milk). 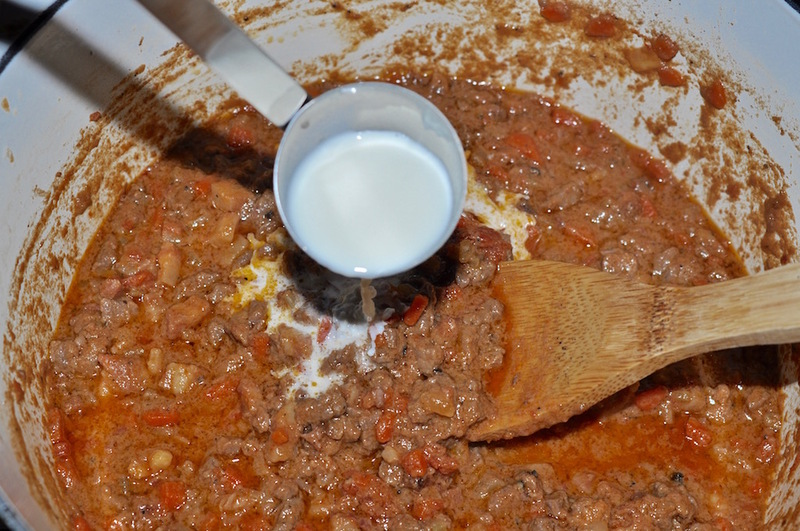 Since this step was "advisable" I decided to throw caution to the wind and use up all the milk. I know, this looks awfully cream sauce-like, doesn't it. I was nervous too. But it turns out I didn't need to be. 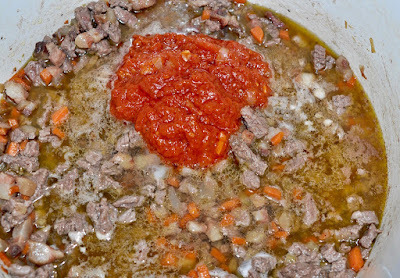 This was a damned fine ragu that I'll be working on until it tastes like I'm back in Bologna. If that doesn't work, there's always Alitalia. Reprinted from Accademia Italiana della Cucina. The pancetta, cut into little cubes and chopped with a mezzaluna chopping knife, is melted in a saucepan; the vegetables, once again well chopped with the mezzaluna, are then added and everything is left to stew softly. 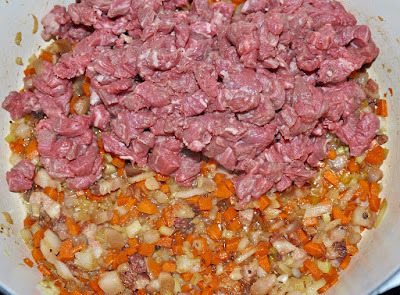 Next the ground beef is added and is left on the stovetop, while being stirred constantly, until it sputters. 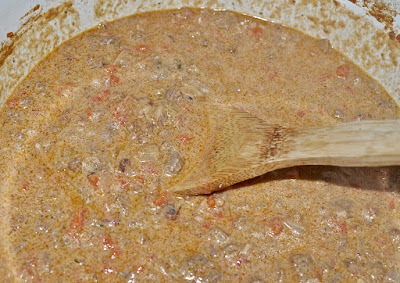 The wine and the tomato cut with a little broth are added and everything left to simmer for around two hours, adding little by little the milk and adjusting the salt and black pepper. 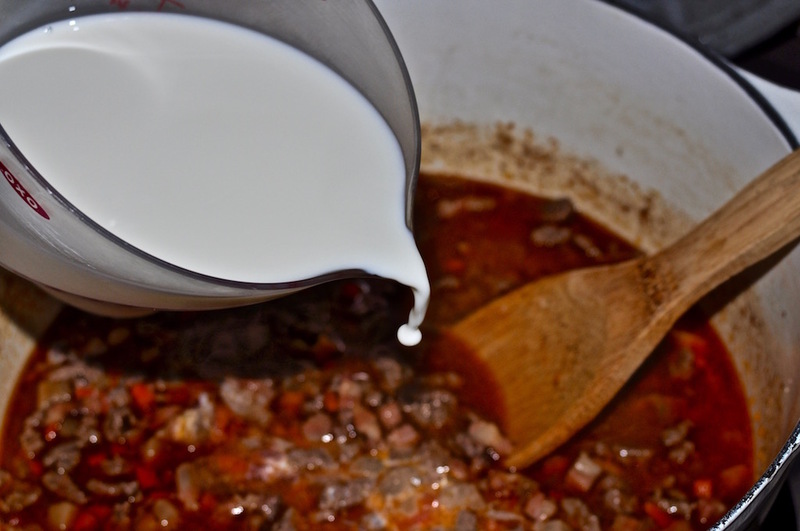 Optional but advisable is the addition of the panna di cottura of a litre of whole milk at the end of the cooking. I'm not going to lie to you. 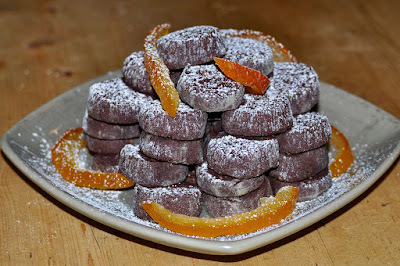 I screwed up with these cookies. Just ask my friend Joe, he'll tell you. For days he'd helped me to unravel the mystery of, well, let me just show you. This solid brass die fits onto an extruder known as a torchietto, one of several fine pasta-making tools gifted to me on a recent trip to Italy. As it turns out, this particular die, which I purchased separately and without first investigating, is not designed for making pasta at all. 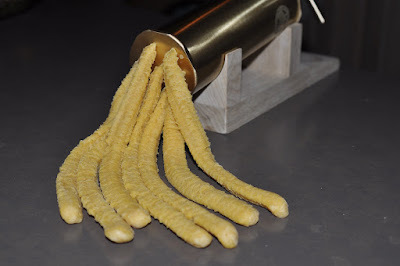 I discovered this the hard way, of course—after preparing a batch of my tried and true fresh pasta dough and then running it through the torchietto. I mean, just look at those giant things, would you! Pasta this ain't. 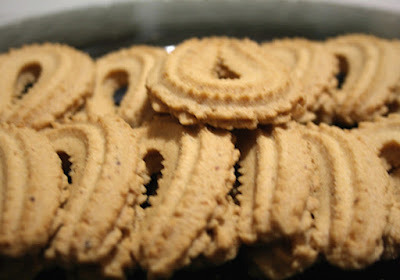 Turns out the die is for making this Piedmontese biscotti (photo not mine) known as Quaquare di Genola. Neither Joe nor I were familiar with the exact term; we just knew that we liked the cookies. 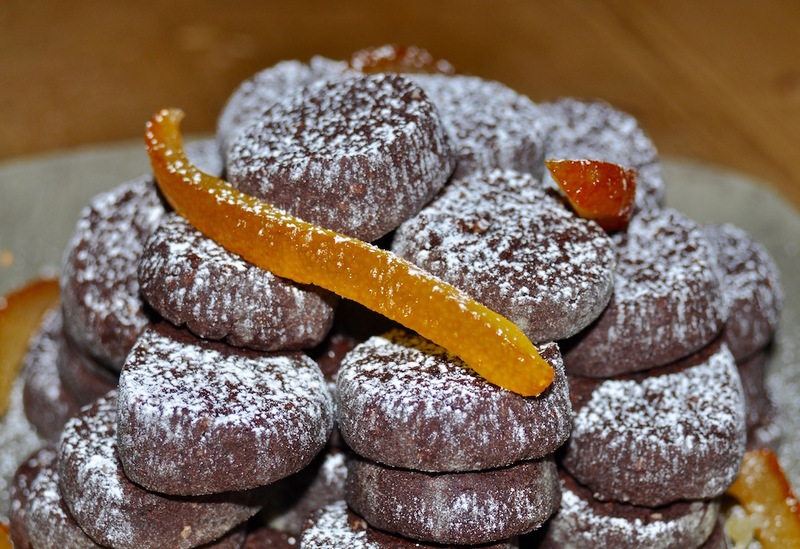 And so the next day I brought out both the torchietto and the die again and set out to make a chocolate-and-almond version of the Quaquare di Genola. 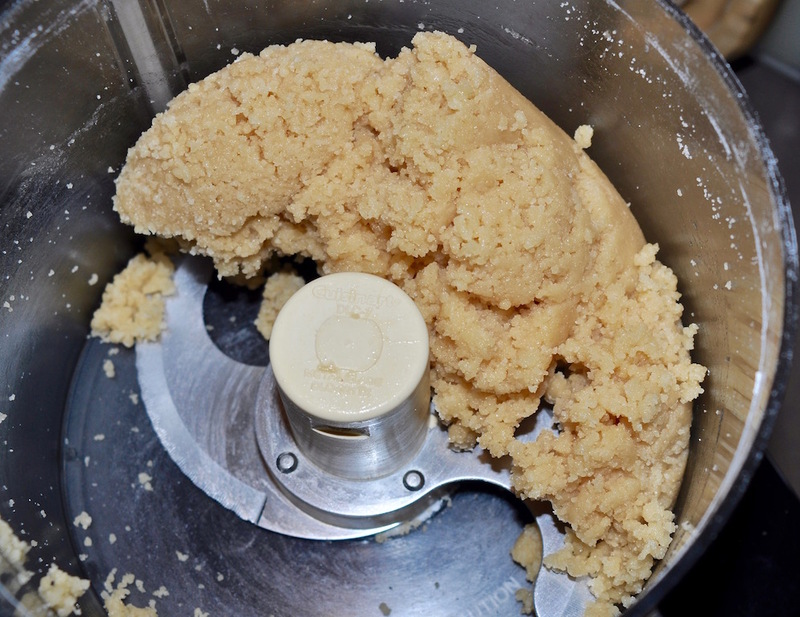 Which brings us back to me being such a screwup—one who probably ought to stick to pasta-making, not baking. The cookie dough came out of the torchietto looking a little like the Piedmontese biscotti but in no way would the forms hold together well enough to get onto a baking sheet. Which is too bad. Because once I ditched the torchietto the cookies turned out to be really excellent—totally worth giving a try, I think. Though considering my now well-documented deficiencies as a baker I wouldn't blame you for looking the other way. 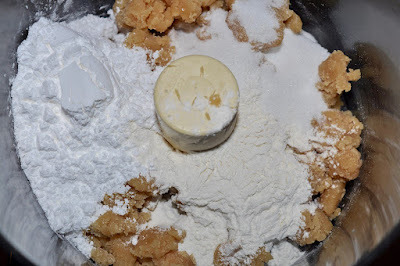 Mix the flour, cocoa, salt and baking soda in a bowl. 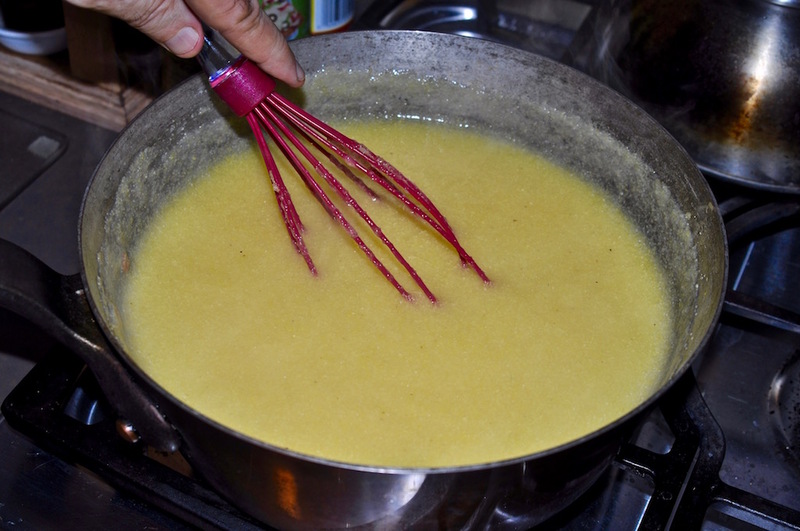 In an electric mixer blend together the butter, sugar and orange zest until fluffy. Add the egg, egg yolk, orange liqueur and almonds and mix thoroughly. 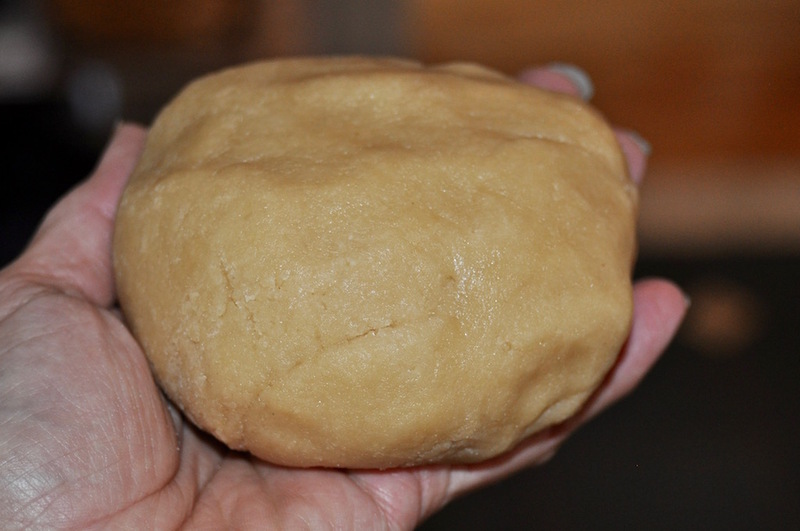 Wrap the dough in plastic and refrigerate for an hour. On a floured work surface divide the dough in four and roll out each piece into a log around 1 1/2-inch around. One at a time slice each roll into pieces that are around 1/4-inch thick, then lay the pieces out on baking sheets covered in parchment paper. Bake for around 9 or 10 minutes in a 350 degree F oven.